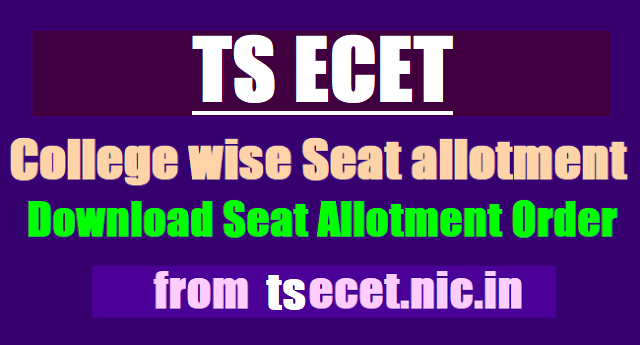 TS ECET 2019 College wise Seat allotment to be released at tsecet.nic.in: TS ECET seat allotment 2019 result to be declared, download at tsecet.nic.in,download seat allotment order: TS ECET 2019 College Wise Allotment Results/Provisional Allotment List for admission into University and Private Engineering Colleges and Pharmacy Colleges. The Telangana State Council of Higher Education (TS SCHE) will released the final phase college-wise Seat allotment details for TS ECET 2019. Candidates who have appeared for and cleared the exam can check their results on the official website of the Council. 5. The payment of tuition fee and self-reporting through the website will begin on July 17 and the candidates have to report to the allotted college. Options given in the first phase will not be considered for allotment and candidates have to exercise option afresh. During certificate verification, the candidates Aadhaar details will be verified with UIDAI (Unique Identification Authority of India) at the Help Line Centers. Therefore it is mandatory for the candidate to attend for certificate verification. ABOUT TS ECET: TS ECET was organised by JNT University, Hyderabad. The University conducts this exam on the behalf of the Telangana State Council of Higher Education. The entrance exam is held every year for admissions into government/ private universities and institutions. Candidates can take admission into second-year regular BE/ BTech/ BPharmacy courses. JNTUA has issued the TS ECET 2019 notification and the University invited online applications from the eligible candidates from as per schedule through online mode at its web portal ecet.tsche.nic.in. Students who were applied for this stream, they were appeared the engineering common entrance test 2019 which was conducted by 10 AM to 1 PM. The results of entrance test were released and appeared Candidates are checked their results from TS ECET web portal tsecet.nic.in. The Qualified candidates of TSECET-2019 (Diploma holders of all branches including Pharmacy & B.Sc. Maths) were exercised their web options. ADMISSIONS INTO ENGINEERING & PHARMACY (TSECET - 2019): TSCHE will announce the seat allotment result of TS ECET 2019 on the official website – tsecet.nic.in. Engineering Common Entrance Test (ECET) is conducted by Jawaharlal Nehru Technological University Hyderabad on behalf of TSCHE.